Professionally, Henry Cole was a busy and influential man. Maybe that’s why there is a lot more known about his professional life than his private life. With all the demands on his time, he did try to keep up with the social graces, but one year around the holidays, time just got away from him, and he had to solicit help in sending greetings to his friends. Cole started working when he was 15 years old. He was born in Bath, England, the son of an army officer, but he moved to London for the opportunities. One of his first jobs as a civil servant was the Assistant Keeper of Public Records. He fancied himself a writer and began his publishing career with pamphlets about reforming the public record system. His efforts led to the establishment of the General Record Office. Flush with success, Cole, along with two partners, edited and published the Guide newspaper, the Historical Register and the Journal of Design. In addition to writing, design was a field that he was passionate about. It’s unknown whether he was educated in design and the decorative arts or if his passions and instincts fueled his achievements, but his influence spanned administrative duties as well as his own creative projects. A MAN OF MANY TALENTS Much of Cole’s personal work was done under the name of Felix Summerly. As this alter ego he wrote children’s books, handbooks of the National Gallery, Hampton Court and other art exhibitions, and many articles of various subjects. He also designed the Felix Summerly Tea Service which was made by the Herbert Minton ceramic factory. This became so popular that Cole, perhaps a bit of a snob, opened Felix Summerly’s Art-Manufactures with the goal of commissioning work from artists that would raise the level of industrial design and the overall taste of the general public. In 1840 Cole was credited with being instrumental in revamping the postal system and creating the first self-adhesive postage stamp: the Penny Black. A profile of Queen Victoria was on the stamp, and Cole provided the sketch of her that was used based on a medal done by William Wyon. As a member of the Royal Society of the Arts, Cole met Prince Albert and accepted his commission to organize the Great Exhibition of 1851. This merging of art, industry and manufacturing was so successful that there followed similar exhibitions in London and Paris, and it was instrumental in reforming the patent laws a year later. Cole’s influence extended into education when he was asked, on behalf of the government, to reorganize the Schools of Design. He became head of the Science and Art Department, a job that lasted 21 years. At the end of the Great Exhibition of 1851, Parliament authorized £5,000 to purchase the most striking objects that were on display to be part of a permanent collection along with the best drawings from art schools from around the country. Cole founded The South Kensington Museum to exhibit these works. Queen Victoria was on hand for the official opening, and in 1899 it became the Victoria and Albert Museum. Cole retired in 1873 after 50 years in public service, but that didn’t seem to slow him down. He continued to channel his experience and expertise toward education and established the National Training School for Music and the National Training School for Cookery within two years. In 1875 he was rewarded for his service by receiving the Order of the Bath. It was Queen Victoria herself that recommended he be knighted. STARTING A TRADITION With all of this resume building, it’s easy to imagine that in 1843 Cole was just too busy to write Christmas cards. The custom at the time was to hand write each one individually, but that just wasn’t going to happen. Cole hired London artist John Calcott Horsley to design a card for him to send to all his friends. It was a triptych with scenes on each of the side panels depicting the charitable essence of Christmas: feeding the poor and clothing the homeless. 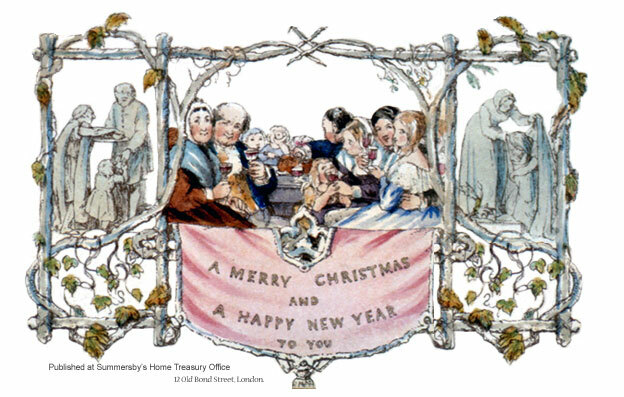 In the center was the message “Merry Christmas and Happy New Year To You” under a colorful drawing of a family celebrating, their wine glasses raised in a toast. Horsley made 1,000 lithographic copies of his greeting card measuring 5 1/8 inches by 3 and 1/4 inches, and he hand colored each one himself. The cards that Cole did not send were sold in the Felix Summerly art shop on Bond Street in London for six cents each. Since it is estimated that there are only about a dozen still in existence, they have become quite collectible. In December 2008 one sold for £8,500 (over $13,000 today). Cole never slowed down even as he aged. He had a known heart condition, but at the end of 1881, with the help of his daughter, he started writing his memoir highlighting his half century of public service. On Monday, April 17, 1882 Cole sat for a portrait with the famous painter Whistler. That night his condition worsened, and he died the following evening.